One day, which happens on rare occasion, Baggio came for the lunch, and he was so frustrated, because a freshman brought to him over 300 floors building plan for exercise, instead of concentrating on something smaller in size but precise and detailed. So in his frustration, he asked him if he could name 10 architects, to which this student experienced blackout after naming only 3. I understand him, for I was a cocky student too. I still am. 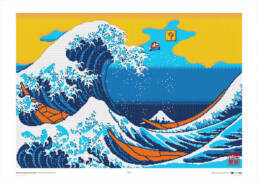 But the story got stuck in my mind and it resurfaced to me when I was thinking about what to do with this Great Wave. So I said, let´s call it Can you name 10 architects, and place 10 architects in boats instead of Japanese fishermen. They liked the idea, and it also showed my cockiness, that sometime works for or against me, pushing me to go outside of my safe area. I haven’t painted a portrait since 1999 and I have never made one based on photograph. You can read more about Can You Name 10 Architects here.